The Environmental Justice Foundation has has opened a new pop-up shop in Soho to sell exclusive T-shorts by designers like Vivienne Westwood and Katherine Hamnett to raise awareness of the drastic decline in bee populations around the world. It's open every day until 10th of September. "‘In celebration of their new Woodlands Project, successful Bee Campaign and to bring nature in to the heart of London, the Environmental Justice Foundation (EJF) have opened their 8th London pop-up shop called ‘JUST… BIG TREES little bees’ featuring a new range of EJF bee t-shirt designs as well as the classic ‘Save the Future’ design by Katharine Hamnett and Vivienne Westwood’s Climate t-shirt which is exclusive to EJF. Rapanui Clothing has designed a bee t-shirt exclusively for EJF in support of their Save the Bees campaign which raises awareness of the drastic decline in bee populations due to toxic pesticides and environmental factors and the need to save them for our own food security. 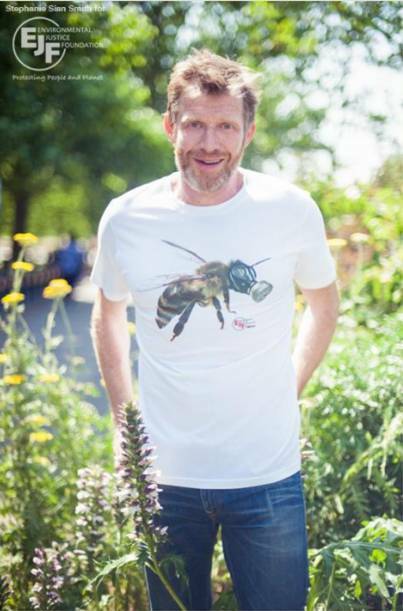 EJF and Rapanui will be working together with celebrity supporters, including Lock, Stock and Two Smoking Barrels actor Jason Flemyng (pictured above), who are modelling the t-shirts to raise awareness of the need to Save the Bees. The EJF Rapanui bee t-shirts are made in a wind powered, ethical factory and they are printed on 100% organic cotton. Accredited by the Fair Wear Foundation, they are low carbon and transported by ship not air. They are printed with phthalate-free inks and hand-finished in the UK."